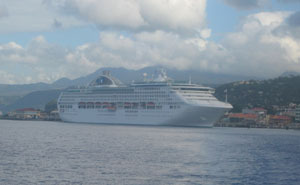 The Port of Miami has reported that 2011 was the fourth year in a row topping four million plus cruise vacationers. "No other cruise port in the world comes close to matching our passenger traffic," according to Port Director Bill Johnson. The Port of Miami also continues to rank as the number one container port in the State. In related development, Johnson said the Port is adding three additional cruise lines including Regent Seven Seas Cruise Lines, MSC Cruises, and Disney Cruise Line. Additionally, the Port will welcome three new-build ships this year now under construction in Europe-the Celebrity Reflection, the Carnival Breeze and the Oceania Riviera. More than 50 percent of its trade is with South and Central American nations. "The strength of the Latin American economies continues to benefit our port," Johnson said in a prepared statement. "Known worldwide as the Gateway to the Americas, Port of Miami continues to grow as a logistical hub linking North and South America." Johnson stated that Port of Miami has set an ambitious goal to double its cargo traffic over the next decade that would provide a boost not only to South Florida's economy, but the entire state. Cruise ships keep port of Miami busy. Johnson expects the growth pattern to increase significantly once the expanded Panama Canal opens in 2014 and trade patterns shift in favor of Atlantic ports which meet depth requirements to accommodate the new, super-sized cargo vessels. Port Miami is scheduled to be at the required 50 feet depth to handle Post-Panamax ships at the same time the Canal expansion is completed. "As the closest U.S. port to the Canal, Port of Miami will be the first port of call out of Panama for shippers seeking all-water routes to East Coast markets," Johnson said. This is expected to boost Miami’s cruise traffic even more.